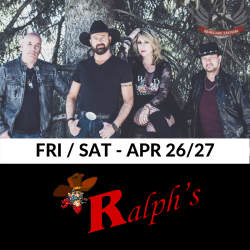 Ralph's Texas Bar & Steakhouse - Life's too short to go anywhere else. 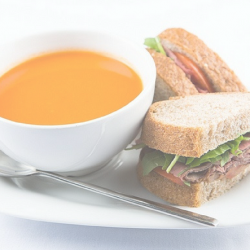 Check out “Food Features” section below to see what the soup & sandwich are today! 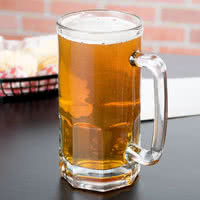 Enjoy a frosty Schooner of Ralph’s draft for only $6.50! 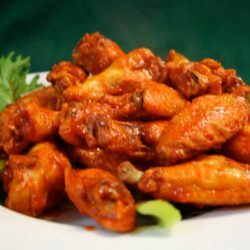 Join us on Wednesdays starting at 4pm for savoury chicken wings for 1/2 price! 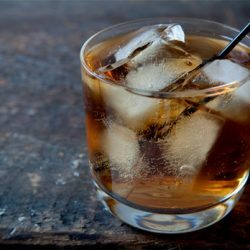 Throwback Thursday pricing: Premium gun highballs are $4 all day & night on Thursdays! 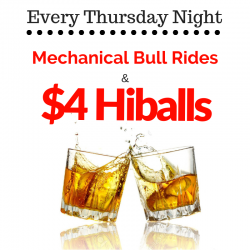 Mechanical Bull Riding Every Thursday Night. Ride free the week of your birthday! Choose from 6 different paralyzer flavors, each for $5.25! Life's Too Short To Go Anywhere Else! 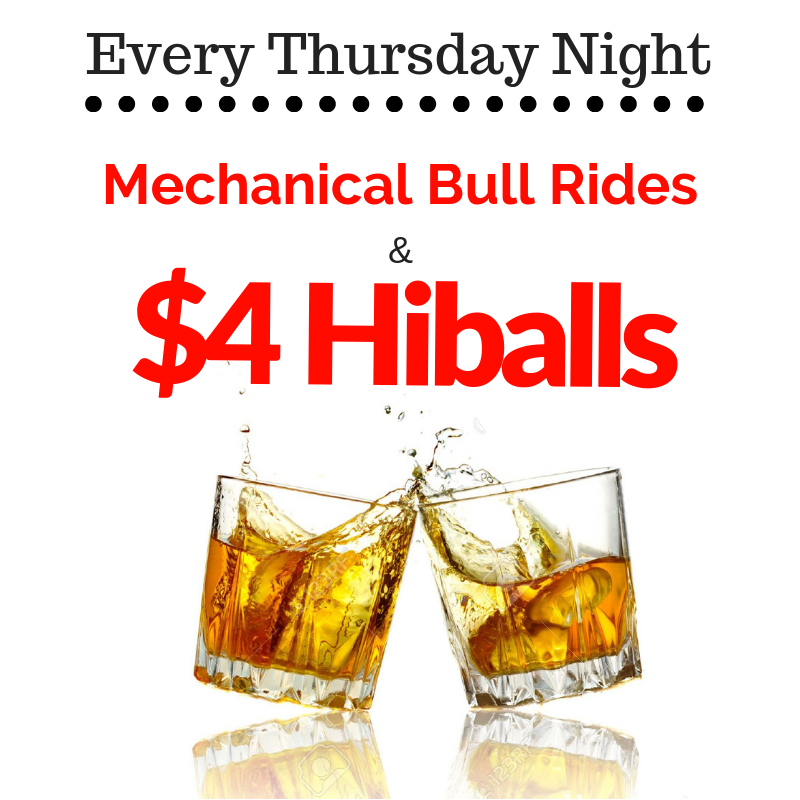 Every Thursday premium hi-balls are 4 bucks all day and night long! Free ride the week of your birthday! 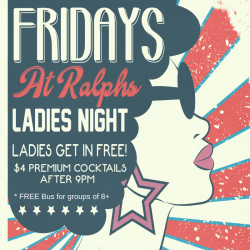 Fridays are for the Ladies!Ladies Only - $4 cocktails all night & free admission with live music by Renegade Station. Got a lot of friends!? 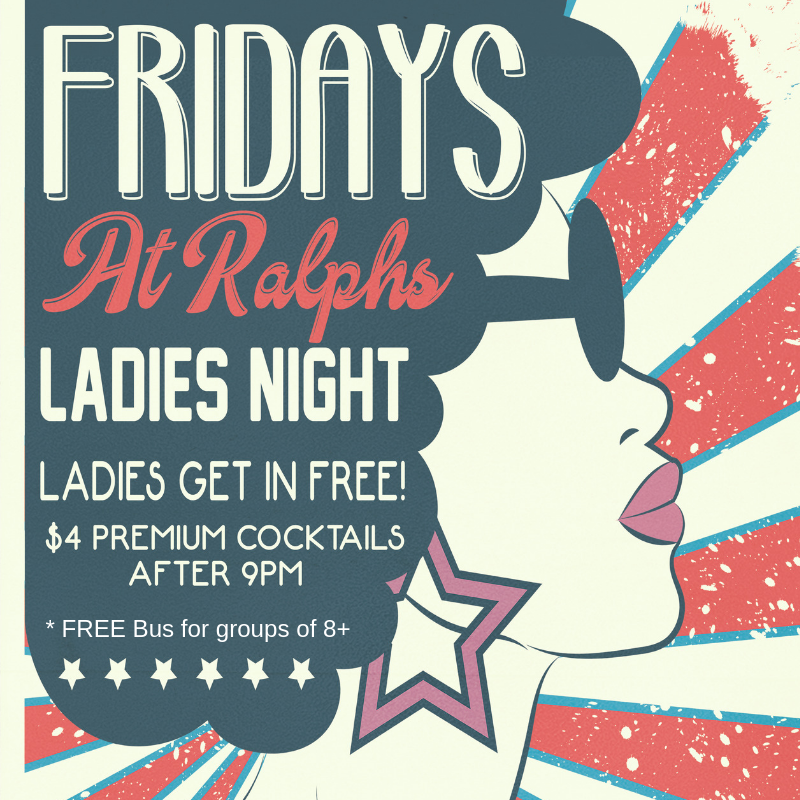 Let us get your party to Ralph's with a free shuttle for groups of 8+ ladies!With the release of their new album, Along for the Ride, Alberta’s Renegade Station embarks on a dynamic musical journey that sees the talented quartet elevating their already impressive reputation for creative excellence and superior showmanship to new heights.Originally known as Domino, the band came together almost accidentally as husband and wife duo of singer/bassist Luanne and guitarist Russell Carl began attending and performing at a town variety show in Stettler, not long after moving to the rural Alberta community. There they met guitarist/vocalist Kent Nixon and drummer Scott McKnight at the popular event and decided to create a band to play local dances and parties becoming the ‘go to’ act on the circuit. With the release of their new album, Along for the Ride, Alberta’s Renegade Station embarks on a dynamic musical journey that sees the talented quartet elevating their already impressive reputation for creative excellence and superior showmanship to new heights.Originally known as Domino, the band came together almost accidentally as husband and wife duo of singer/bassist Luanne and guitarist Russell Carl began attending and performing at a town variety show in Stettler, not long after moving to the rural Alberta community. There they met guitarist/vocalist Kent Nixon and drummer Scott McKnight at the popular event and decided to create a band to play local dances and parties becoming the ‘go to’ act on the circuit. Find out why we are #1 in Medicine Hat! "Life's Too Short To Go Anywhere Else!" Ralphs Steak House is proud to serve only the freshest and highest quality food available. 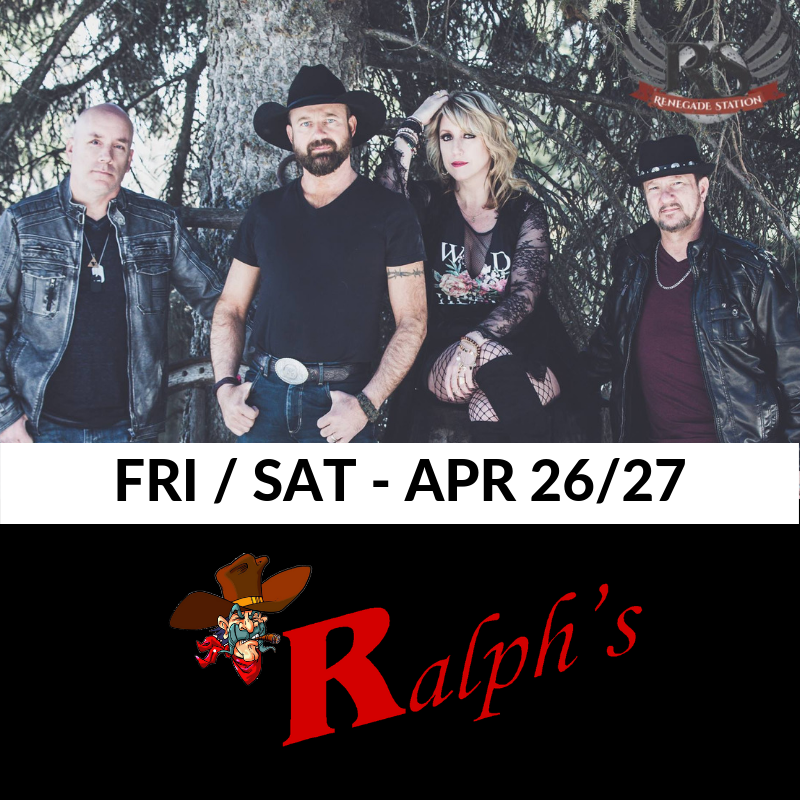 Open since October ‘03, Ralph's Texas Bar & Steak House is Medicine Hat’s premier Country Nightclub & Steak House including dancing & live entertainment. Our chefs will ensure that once you have your first bite, you will know why we are labeled the best steaks and slow cooked prime rib in town. Enjoy our Salsa Bar, Ralph’s twist on a salad bar, with tri-coloured nachos and 10 assorted flavours of salsa, complimentary when you order an entree in our Steak House. Our Sterling Silver Alberta beef is amongst the finest in Canada, renowned for its tenderness, juiciness and flavour. If beef is not what you crave, our delectable menu has a variety of entrees to choose from. Ralph’s is a ‘Dine and Dance’ facility Please feel free to dine, and if you wish, stay and enjoy a night of dancing. 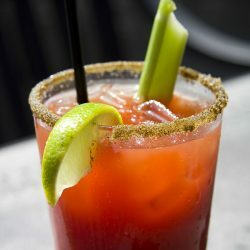 Enjoy a frosty beverage and the big game on any of our 26 plasma TV’s, some right at your table. 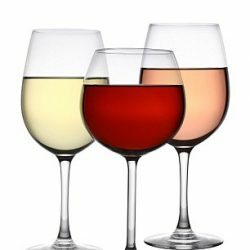 Contact us to book your next party or event! We are the premier facility in Medicine Hat for every function. 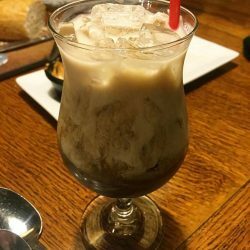 I made my first visit to Ralph’s in Sept and was amazed at this place! It is one of the best hospitality venue’s I have set foot in, and as a restaurant and bar veteran, I have been in many around the world. They have something for everyone, young and old. 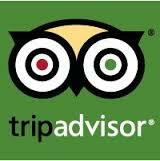 The restaurant is fantastic, I had the prime rib and it is one of the best I have ever had. 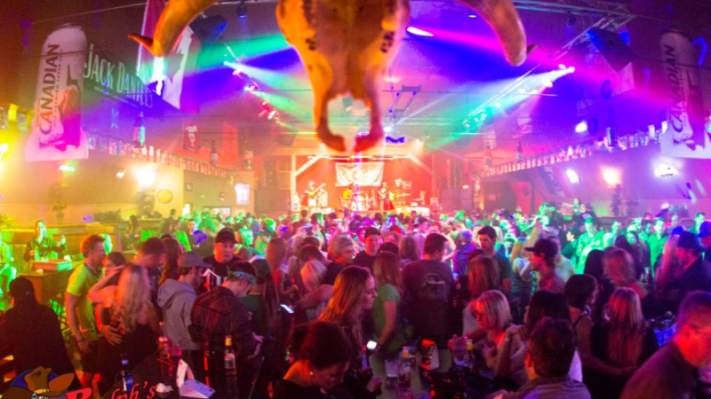 They have a full country dance hall with a live band as well as a pool hall in the back. The other side is a full on sports pub with ton’s of TV’s and great menu of upscale pub food. This is a great place to meet friends and spend the night, never have to leave to get a full night of entertainment. I can’t believe I lived in Medicine Hat so long and didn’t go here more! Food was amazing! Staff was amazing! And the management was so nice and friendly. I would recommend going here for anything. 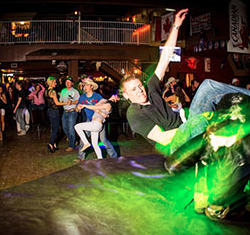 You can even ride a mechanical bull! Woohoooooo! 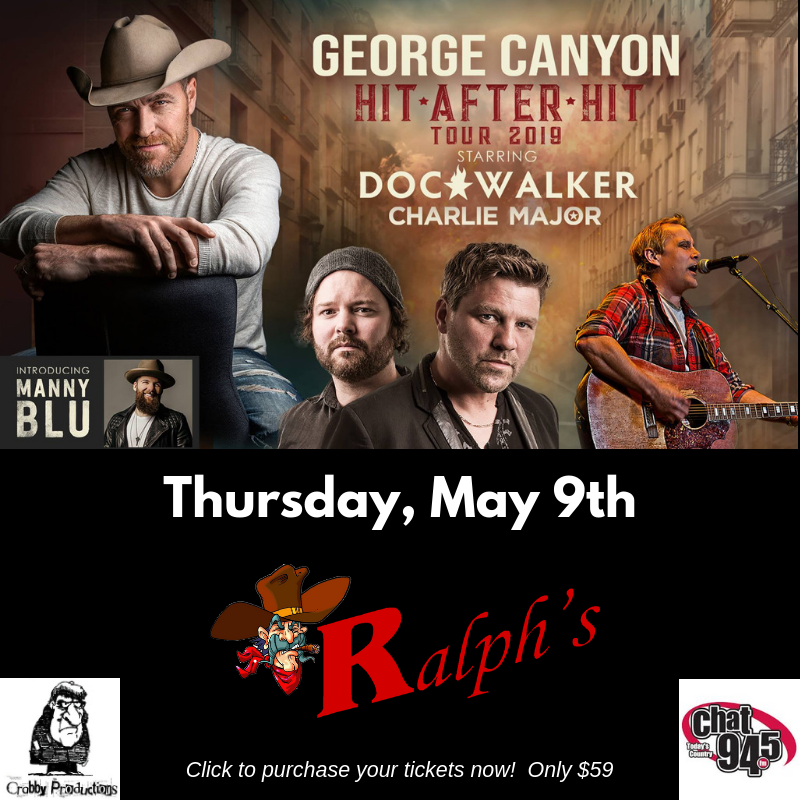 TRUST ME, GO TO RALPHS!!!! We were passing through Medicine Hat and stayed at the Super 8 across the street and desk clerk highly recommended your Steak House. We went for dinner and was hugely surprised! Staff welcomed us and gave us the tour of the place which is HUGE! Being at a steak house and staff recommending steak and being very proud of their cuts of beef we had to try! I must say I truly couldn’t stop humming and awing over my steak and hubby loved his also! I had the Tenderloin with Blue Cheese Butter… AWESOME AWESOME AWESOME Hubby had the Rib Eye with Crab, Asparagus and Holidaise Sauce! AWESOME AWESOME AWESOME! If you ever have a chance to go to this restaurant or are passing through Medicine Hat.. go and check it out, it’s the BEST!